Remove King pins with relative ease and efficiency. The heavy duty king pin press generates 46,000 lbs. of force but weights only 30 lbs. less than 75% than our closest competitor. For use on straight and tapered king pins from 7/8" to 2 5/32". Isuzu NPR and GMC/Chevrolet W-series trucks require a custom adaptor (Part Number 90150-15). Note: Not compatible with: FL981 axles where the tie rod is cast to the spindle. 75% less weight than our closest competitor. 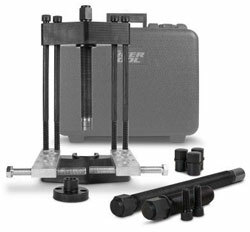 Anti-torque arms prevent twisting of the main body while under extreme force. Engineered for use with up to a 1" impact tool. Note: User replacement parts and accessories provided by Tiger Tools only. All replacement parts and accessories are available. Keep hydraulic coupler protected when not in use. Dust caps should be used on couplers when not in use to avoid contaminants from entering the hydraulic cylinder and power source. This practice will help to extend the life of this product and ensure continued consistent operation. The 1.25" diameter forcing screw (6" length) is used on king pins 1.25" in diameter or larger where there is limited space above the king pin. Once the short forcing screw has run out of travel exchange for 12". The 1.25" diameter forcing screw (12" length) is used on 1.25" diameter or larger. Note: Both 1.25" diameter forcing screws share the same anvil. Select the corresponding forcing screw and thread it into the screw plate. Rest the assembly on top of the spindle aligning the forcing screw over the king pin. Select the clearance plate and two 1⁄2" x 15" long socket head cap screws. Align the center hole of the clearance plate under the spindle to the screw plate above. Install the two 5⁄8" x 15" long bolts in the outer holes and thread them into the clearance plate. Select the two 5⁄8" x 6" long tap bolts that are located beneath the torque arms and thread them into the torque arms as shown. Select the remaining two 5⁄8" x 15" long socket head cap screws and install them into the inner holes on the screw plate and torque arm, and thread into the clearance plate. Adjust the tap bolt length so the heads are resting against the axle. Snug up the four 5⁄8" x 15" long socket head cap screws so that the frame does not shift. Apply force to the forcing screw using an impact gun to begin operation.